Yes, you can have it all. The privacy of a single-family home; the convenience of a townhome community; and easy access to shopping, schools, and recreation does all exist in one place. And that place is Arbor Glen in North Reston. The Arbor Glen community of 44 townhomes was built between 1986 and 1988. Privacy was top of mind when Miller & Smith designed these spacious 3 and 4 bedroom homes. The townhouses are arranged in groups of four to six in a “Z” row, which means that each house feels more private—you never look into a neighbor’s house, and the row design minimizes noise from the adjoining homes. Nestled in a wooded area, the common space is tranquil and beautiful. While the neighborhood may feel secluded, Arbor Glen is less than a five-minute walk to North Point Village Center and Lake Newport pool (Reston’s only Olympic sized pool), and Reston Town Center is less than 2 miles away. 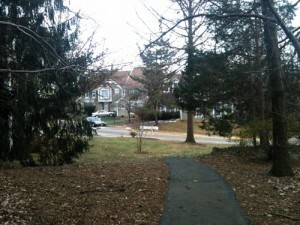 While Arbor Glen is right off busy Lake Newport Road, and close to Reston Parkway (only the soccer fields stand between the two), the neighborhood is exceptionally quiet. Yes, Arbor Glen Cluster in Reston, VA is one of those rare neighborhoods that has it all—lovely architecture, plenty of common space, and privacy. Lot’s of privacy.